Baltimore native Philip Morsberger (b. 1933) studied at Oxford in the mid-1950s and from 1971-1984 was the university�s Ruskin Master of Drawing. He used the prestigious position to develop and head a now renowned, full-blown art department at Oxford University. 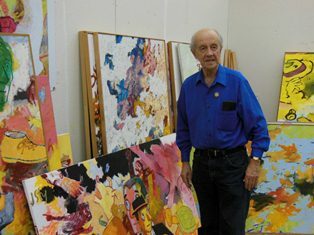 In the United States, Morsberger has taught at Harvard University, Dartmouth University, UC Berkeley, the California College of Arts and Crafts, Miami University and other institutions. He retired from teaching after a five-year stint as Williams S. Morris Eminent Scholar in Art at Augusta State University in Augusta, Ga. His work is in several museums, including the San Francisco Museum of Art. Morsberger begins each work as an abstract non-representative painting of varying colors. After his abstract painting is complete, he contemplates the completed work and as he does so images from his past and his imagination come out of the work, much like when looking at clouds in the sky. 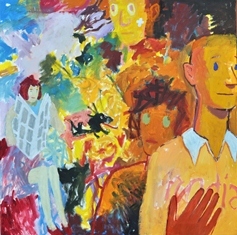 He then paints over the abstract painting the images that he sees in the work, i.e. faces, turtles, shoes, Latin phrases and so forth. Some works end at the abstract, but the works we have selected for our gallery exemplify the humor and genius of Morsberger.